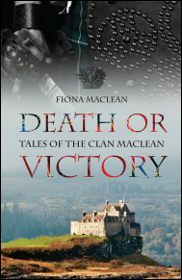 Death or Victory, a light-hearted re-telling of twenty-one of the Clan's stories, was commissioned by the Clan Maclean Heritage Trust in memory of the Chief's first wife Mary, who died in 2007. Proceeds from the sale of the book will go to support further projects that reflect her keen interest in children. Written by Fiona Maclean of Ardgour, the book traces the story of the Clan from Gillean of the Battleaxe through to the re-possession of Duart Castle in 1912. The title is a reference to the Clan motto Vincere vel Mori, meaning "Conquer or die", demonstrated all too vividly by the stories of the battles of Harlaw, Inverkeithing and Culloden. Other tales include the story of how the Macleans won their lands and reveal why visitors may still hear groans from the dungeons at Duart Castle. The book is delightfully illustrated, with twenty cartoons drawn by Brian Turnbull, and includes maps, a glossary of Gaelic words and a date chart. In keeping with the objectives of the Lady Maclean Fund, this book is intended mainly for the younger members of the Clan. It provides a wonderful introduction to the Clan's history. Clansfolk of all ages, however, will derive enormous pleasure from this thoroughly enjoyable book. When ordering copies as gifts for your family, remember to order an extra copy to keep for yourself!